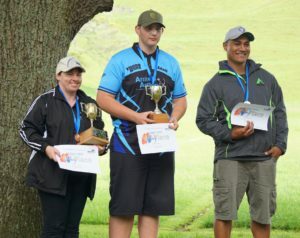 The One Tree Hill Cup was shot on 1 and 2 December 2018 at Auckland Archery Club, during the start of what turned out to be quite a storm! The first day was windy and rough for all archers as they shot the ranking round, and there were smiles of good cheer in amongst the complaints about how hard it was to stand up or brace against the swirling wind. The weather forecast was awful for the Sunday, but in actual eventuality it dawned clear and warm, which was perfect for a day of matches. In the Recurve division, dramas in the quarter-finals happened as Finn Matheson and Cheree Kinnear came up against each other and were neck and neck right up to a one-arrow shoot-off. Cheree clinched her spot in the semis with a stunning ten to Finn’s nine. The bronze medal match was finally decided between Cheree Kinnear and Struan Caughey, with Cheree taking the medal with 6 points to Struan’s 4. The gold medal match was heart-in-mouth material as Chayse Martin-Roberts fought the brave Olivia Sloan – was Olivia going to become only the second woman to ever take the One Tree Hill Cup? It was a tough one as the lead wavered to and fro, until Chayse had the final end in his sights and never let go. Congratulations to Chayse for his gold medal and Olivia to her silver. In the Compound division, first-ranked Adam Niziol met up with 16th-ranked Marcus Barclay in his first match and Marcus took him right down to the wire with a single-arrow shoot-off, but it was Adam’s final arrow that won the match, setting the tone for the rest of the afternoon. While Elizabeth Randle, Lisa Walker and Fred Leota snuck through their matches to get to the medals, Adam Niziol dominated. Elizabeth Randle and Lisa Walker went for the bronze, with Lisa Walker just nudging Elizabeth out by a single point to take the medal. Fred Leota and Adam Niziol finally ended up facing each other for the gold medal match. Hearts were beating rapidly as the two Mountain Green archers, who were ranked #1 and #2, sent arrow after arrow down the range. But the day belonged to the young Adam Niziol who won the match 142 to 137. Congratulations Adam for his gold medal and Fred for his silver. The fun shoots were done on the Saturday in very strong wind. Andrew Russell won the mini-clout with the very first shot, and he also won the Iron Kiwi in the compound division. Finn Matheson took the Iron Kiwi in the recurve division. There weren’t many entries this year… it was almost like people wanted to keep their arrows from being destroyed! Congratulations to everyone who participated in this weekend’s One Tree Hill Cup tournament. Special thanks to our sponsor, Archery Warehouse, and thanks to the judges, DoS, and club members who made this event happen. 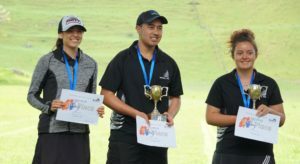 archery, auckland, one tree hill cup, results, tournament. Bookmark.